Hard rock n’ roll, or American punk/pop-rock influence? Its not easy to exactly draw the line in the music of Solity. Solity’s first album came out in this april, but despite the fact that its the debut disk of these guys, in the style there is an explicit feeling of determinism and professionalism. Songs can not exactly classified- its a kind of nowadays really „in vogue” style, mixing the different melodies of eras and areas. Solity follows the trend pretty well, but they spread some extra spice by adding soft and hard effects as initial sounds inside the tracks. These are those sides, where blues, boogie, or different soft rock n’roll elements could appears, not only additional. 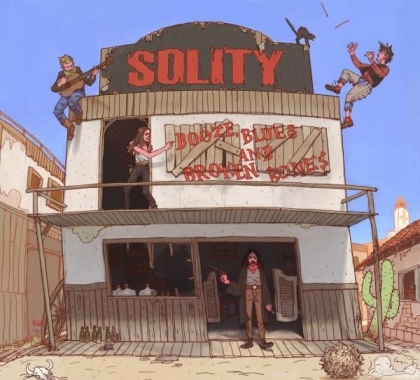 „Booze, blues, and Broken Bones” disk is basically an American punkrock and pop-rock influenced, strong vocalized collection of modern fusion live-music, added the upper spices, to shake it up and down to get the Solity tone. The American-like style is hardly could be influenced by a kind of Green Day, Foo Fighters or Blink182 music, but in a really Swedish way of play real music as they do it, added together the best tempo, strong rhythm, with feeling of the best recipe for a sure concert-success album.